All About Mercury in Astrology. Detailed interpretations of Mercury, the messenger of Gods. 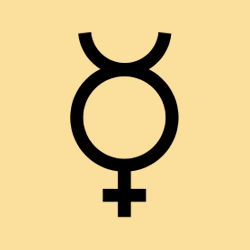 The glyph, or symbol, of Mercury resembles that of Venus, with the addition of a semi-circle (hat) at the top. Spirit (circle) over matter (cross), resulting in receptivity (crescent). Mercury is the planet that rules the way we think and the way we communicate with others. It is the ruler of the third house of Gemini that stands for learning and communication. Mercury stands for our intellectual standing. Mercury rules all sorts of information that you gather in your journey and how you interpret it. It also stands for the travels you make in life.